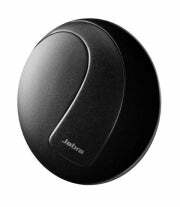 It's not often that a product lives up to its name, but the Jabra Stone ($130, price as of February 10, 2010) does so quite literally. This sculpted black Bluetooth headset fits so neatly into its charging base that the combination looks like a smooth, black, plastic stone--albeit one with a micro-USB socket and a Jabra logo. However, the "stone" isn't just a storage case or a pass-through connection base for a charger. It has its own battery, which, when fully charged, can completely charge the headset--a boon for folks on the go. This means that you always have extra headset charges in your pocket even on long business days when you can't get to an AC outlet or a USB charger. While the headset's battery alone provides up to 2 hours of talk time and 2.5 days of standby time, traveling with the charging base increases available talk time to 8 hours and standby time to 12 days, according to Jabra. The base takes 2 hours to charge with its AC adapter. As a traveling companion, the base makes the headset easy to find in a cluttered pocket, and it provides some protection for the headset as well. The headset and its 0.67-ounce, 1-inch-thick base measure just 2.3 by 2 inches together, which hardly makes a dent in a jacket pocket. The concept of a travel case equipped with its own battery isn't new: Plantronics uses a different style of travel-size battery case with some of its units, such as the Discovery 975. The Jabra Stone supports the Bluetooth 2.1+EDR (enhanced data rate) standard and can pair with up to eight devices, two of which can be in use at the same time. Two small LEDs on the inside of the headset provide feedback on battery status and Bluetooth connectivity. A single LED on the base lets you know if it has enough juice to charge the headset fully. Jabra's penchant for simplicity is reflected in the Stone. Like the company's other headsets, such as the earmuff-style Jabra Halo, the Stone has no on/off switch. Removing the unit from its base activates it, and pushing it back in turns it off. Instead of a volume-control button or switch, the Stone has a touch-sensitive area where sliding your finger up or down will raise or lower the audio. The volume slide area lacks tactile feedback, however; in my use, getting the right touch took a little practice. You can also adjust the headset volume from your phone, if you prefer. Pushing down on the wide end of the headset activates the single button on the Stone, which you use for making or taking calls and for pairing the unit with a cell phone. Since the Stone's molded earhook is part of the device, the unit is designed to fit only on the right ear. Though the earhook is flexible, it is still somewhat rigid and may not fit tightly onto your ear, as was the case for me. A colleague, in contrast, noted that the earhook stayed put on her ear, and felt quite comfortable. The quarter-ounce headset comes with extra earbuds for a better fit if necessary. The Stone, which has two microphones, uses Jabra's Noise Blackout Extreme technology to enhance your voice while blocking out other noises. The unit also has the company's Audio Shock Technology, which arrests sudden spikes in volume. In my tests, callers had no problem hearing me even when I was in a noisy household with televisions and radios running in the background. It's hard to fault the Jabra Stone on style--it certainly looks good inside or outside its "stone" base. But this Bluetooth headset will certainly feel and sound better if you can get it to fit well on your ear. This pocket-friendly headset with a travel-size charging base offers convenience, high-quality audio, and extra hours of talk time when you’re away from an AC outlet.